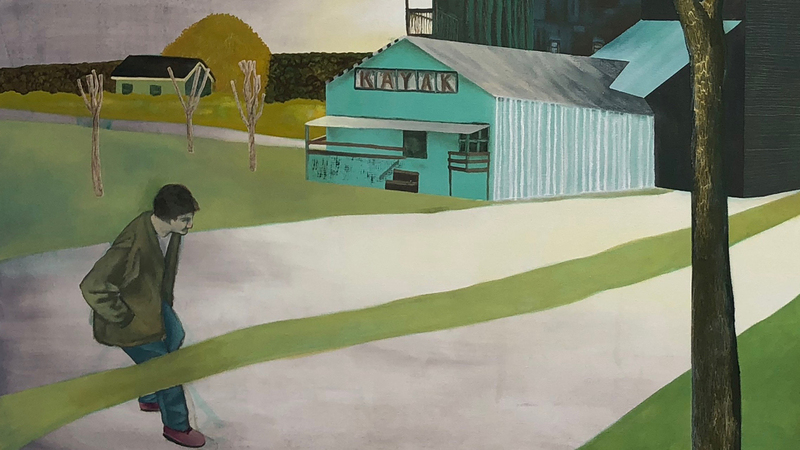 Becky Groves makes drawings and paintings of steep hills, buildings under bridges, outdoor staircases, the end of a road—things that abruptly break up the topography of where we live. Disruptions in the landscape can be suggestive of memory, the passage of time, and ways of life. In these unstable landscapes, figures interact with the landscape but also reinvent it as one often does in dreams. Specifically, a lot of Groves’ work focuses on American small towns and the tension between architecture and the landscape, between the community and big cities, and between industry and the environment.